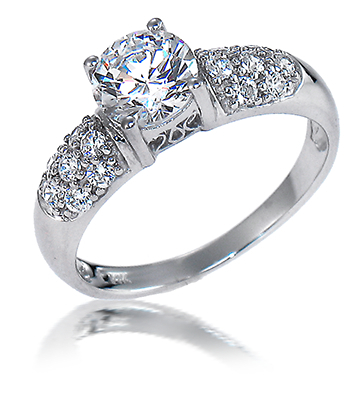 The Katja Round Cubic Zirconia Pave Vintage Estate Style Solitaire Ring features a 1 carat round 6.5mm man made diamond look diamond cubic zirconia center stone set in a decorative basket style setting. The beautiful cut out detailing in the gallery area of the basket setting beneath the center stone gives this ring its vintage antique estate style appearance. 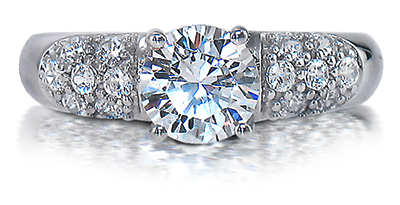 This estate style diamond quality cubic zirconia ring is further enhanced by three rows of pave set round cubic zirconia that line half way down both sides of the shank. The Katja 1 carat round cubic zirconia pave antique style ring ring will make the perfect engagement ring for the woman who wants a unique engagement style solitaire with an antique estate style feel. This solitaire ring features the finest hand cut and hand polished lab created cubic zirconia, for the look and feel of a genuine mined diamonds, all with a lifetime warranty. 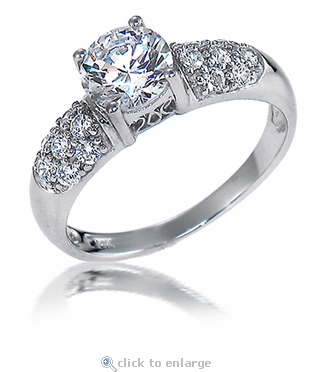 The ring measures approximately 4.5mm in width at its widest point and tapers slightly towards the bottom. The Katja round and pave estate cz solitaire includes approximately 1.7 carats in total carat weight. Shown here in 14k white gold but keep in mind this ring can be made in 14k yellow gold, 18k gold or Platinum via special order.